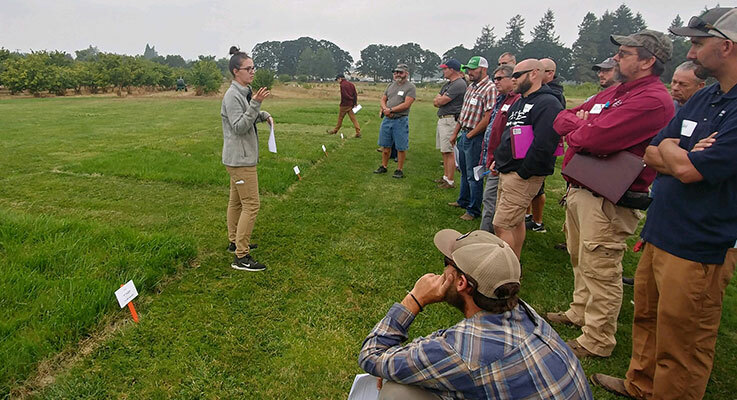 Figure 1: IPM Field Day and Coordinator Training at Oregon State University, August 2018. Photo courtesy of Oregon State University. It is speculated that proper cultural management practices can reduce weed populations in turfgrass without the use of herbicide applications. With new laws restricting access to certain pesticides within turfgrass management and increased pressure to move away from traditional chemistries, implementing an efficient and conscientious cultural management strategy for the Pacific Northwest is important. Oregon’s school Integrated Pest Management (IPM) law requires that all K-12 school districts implement an IPM plan and designate an IPM coordinator. The goal of the Oregon State University school IPM program is to promote healthier school communities by reducing pests, pesticide use, and pest management costs in and around public schools. Part of Oregon State University’s commitment to healthier school communities is teaching IPM coordinators and grounds staff proper turfgrass management practices, including mowing, fertilization and irrigation. These cultural practices improve turfgrass health and reduce reliance on herbicides for management of invasive weeds. To supplement this training a series of research projects evaluating the effects of mowing, fertilization and irrigation on mixed stands of cool-season turfgrass were initiated in spring 2018. The primary objectives of these projects is to determine how variations in the cultural practices effect weed populations and provide demonstration plots for field extension events. Various mowing heights (2 and 4 inches) and frequencies (1x, 2x, 4x per month) at Oregon State University, August 2018. Photo courtesy of Oregon State University. Three field research trials were initiated in the fall of 2017 and will conclude in the fall 2020. 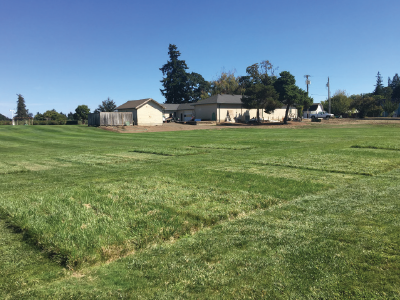 These trials are being conducted on a mixed stand of turfgrass (consisting primarily of tall fescue and perennial ryegrass) at the Lewis-Brown Horticulture Research Farm, Corvallis, Oregon. Six weeks prior to initiation of each trial, two herbicide applications of Speedzone (Carfentrazone-ethyl, 2,4-D, 2-ethylhexyl ester, Mecoprop-p acid, and Dicamba acid) were administered (1.8 fl. oz./1000ft2) with a four-week interval between sprays which allowed trials to begin with a clean stand of turfgrass and no weeds. Perennial ryegrass was then over-seeded (9lbs/1000ft2) to fill in voids left by weeds. Experimental design for the mowing height and frequency trial is a 2 by 3 factorial randomized complete block design with four replications. The mowing heights of 2 inches and 4 inches, and the mowing frequencies of one, two, and four times per month were selected based on the typical practices IPM coordinators use in the Pacific Northwest. With the exception of the initial applications, traditional herbicides are not being applied to the trial area. Fertilizer applications for this study occur four times per year at a rate of 1.0 lbs Nitrogen/1000ft2 per application, twice in the spring and fall. This trial also receives regular irrigation during the summer. 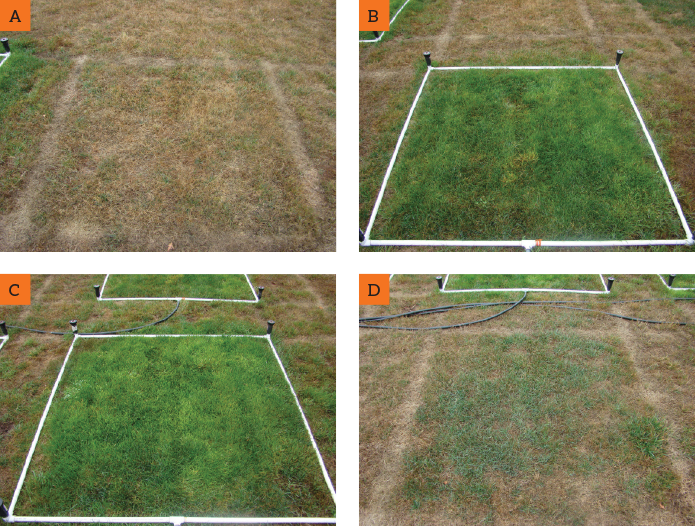 Experimental design for the fertilizer rate and frequency trial is a randomized complete block design with four replications; fertilizer rates within this study were 0, 2, and 4 lbs. N/1000ft2 annually. Fertilizer applications occur either two or four times per year at a rate of 1.0 lbs Nitrogen/1000ft2 per application. As with the mowing trial, traditional herbicides are not being applied to the trial area and the plots receive regular irrigation during the summer months. Experimental design for the irrigation rate and frequency trial is a randomized complete block design with four replications. Treatments include a non-irrigated control, 1.0 inch applied once a month, 0.25 inch applied four times per week, and water applied four times per week with rates adjusted to replenish evapotranspiration (ET). A non-irrigated control was included since there are several incidences of areas in the Pacific Northwest where irrigation is not applied during the summer months. An infrequent irrigation treatment (1.0 inch once a month) was included to determine if minimal irrigation would help maintain turf density while using minimal resources. The idea was to water enough to limit available areas for weeds to move in, which we know will otherwise occur after complete desiccation. A rate of 0.25 inch applied four times per week reflected current recommendations made to IPM coordinators. Previous research determined that 0.25 inch applied four times per week was not optimal in late July and August in Corvallis, Oregon; therefore, a treatment was devised with rates based on evapotranspiration (ET) data collected from the weather station at the Lewis Brown farm. The frequency remained the same, but rates were increased to 0.3 inch in July and August. A final fertilizer application was given four times per year at a rate of 1.0 lbs. Nitrogen/1000ft2 per application. With the exception of the initial applications, herbicides were not applied. Visual quality (1–9 scale, where 1 is worst, 9 is best, and 5 is acceptable) is being assessed every other week. Weed counts are being collected with a 20 inch by 40 inch transect with 36 intersects four times per year. An initial count with the transect showed each trial beginning with no weeds. Figure 3: Irrigation plots three months after initiation of trial (taken Sep 2018); A) no irrigation applied; B) irrigation applied at 0.25 inch four times per week; C) irrigation adjusted monthly based on evapotranspriation rates (ET) from weather station data; D) irrigation applied at 1.0 inch once per month. Photos courtesy of Oregon State University. Preliminary findings showed that a higher mowing height (4 inches) resulted in significantly fewer broadleaf weeds, but the frequency of mowing (once, twice, and four times per month) did not have an effect on weed populations. Over the course of this three-year study, we expect to see mowing frequency also show significance, with lower frequency mowing resulting in higher weed populations. Infrequent mowing at both 2 inches and 4 inches generates large amounts of debris left on the surface which smothers the grass beneath it, opening areas for weeds to move in. Fertilizing turfgrass with 2 or 4 lbs Nitrogen/1,000ft2 annually reduced weed population as compared to non-fertilized turfgrass (Table 1), with higher rates showing the lowest incidence of weeds. Applications of nitrogen increased the density of the turfgrass. The dense stands made it more difficult for weeds to move in. Plots that did not receive any fertility had more voids where weed seed was able to germinate and move into the plots. Analysis of the irrigation plots showed no significance of treatments on weed incidence, but we expect to see the differences over the course of this trial. Plots that received no irrigation over the summer months had the lowest turfgrass density and quality ratings (Figure 3). As the trial progresses, there will be space for weeds to encroach into the unirrigated plots and subsequent grid counts should reflect this. Plots receiving 1 inch per month had a slight improvement compared to plots that were not irrigated. The plots that received 0.25 inch four times per week, and the plot receiving irrigation rates adjusted monthly according to evapotranspiration rates had the highest turf density and greatest turf quality. We are seeing new state laws that restrict access to certain pesticides. There’s also increased interest in finding alternative methods to managing weeds in both school grounds and home lawns. To meet these demands, we need research to explore both the benefits of cultural management practices and the best ways to implement them. Previous research in other areas of the United States has showed that mowing, fertility, and irrigation can significantly reduce weed incidence. The goal of this research is to find optimal rates and frequencies of those primary practices for the Pacific Northwest, that can then be demonstrated and taught to IPM coordinators and others managing turfgrasses in the absence of traditional herbicides. Funding for these projects was provided by a grant from the National Institute of Food and Agriculture; U.S. Department of Agriculture. Emily Braithwaite is a faculty research assistant at Oregon State University (OSU), Brian McDonald is a senior faculty research assistant at OSU, and Tim Stock is a senior instructor at OSU. Alec Kowalewski, assistant professor at OSU, can be reached at alec.kowalewski@oregonstate.edu.